You might want to consider the Panamera S E-Hybrid even if you're not the hybrid type. It can "sail" (or coast) with the gasoline engine turned off, if you lift gently off the accelerator at speeds up to 103 mph. The 2016 Porsche Panamera is a stunning-looking, surprisingly good-driving mashup between a large luxury sedan and a high-performance sports car. 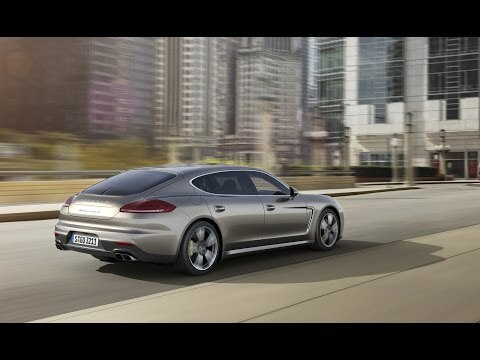 Because of its large and truly usable back seat, upscale cabin appointments, and great driving dynamics—plus a range of powertrains that permit frugal plug-in hybrid operation or near-supercar performance—the Panamera offers something to delight nearly every member of the family or any luxury purchase reason. The Panamera's recipe for success is also the reason why it doesn't appeal to everyone. The look—especially at the rear—is polarizing, and the pricing of this luxury hatchback can spiral out of control if you don't use a lot of restraint with the options order sheet. 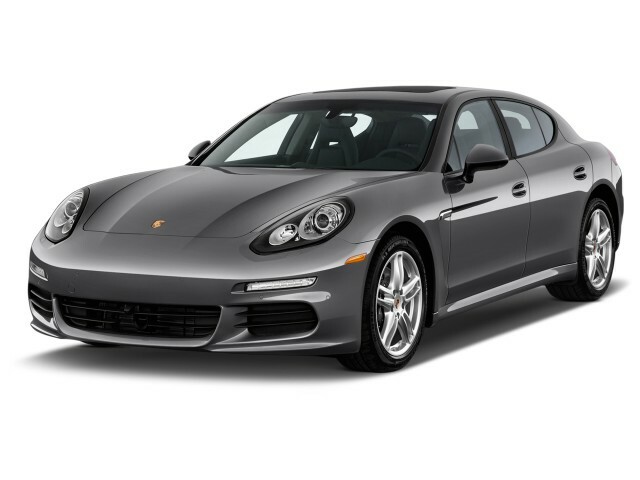 Depending on how a Panamera is optioned up, and on what's under the hood, this Porsche makes an interesting alternative to a wide range of vehicles, including the BMW 6-Series Gran Coupe, Mercedes-Benz CLS, or Mercedes S-Class, or even an Aston Martin Rapide or Maserati Quattroporte. The Panamera has the face of the legendary 911 sports car, yet with its long roofline and the arch near the rear end, the proportions are different going back and depending on your viewpoint it might either be awkward or an alluring, super-sized Porsche. The cabin's sportscar touches are welcome; there's a button or a knob for almost every function, so there's no muddling around with touchscreen controls. In the back, the Panamera's an executive limo, with plenty of space and features—and last year's introduction of Executive models and their longer rear doors underscores that side. To sum it up, throughout most of the 2016 Panamera lineup you'll find straight-line acceleration that's sports-car quick, as well as excellent high-speed stability. Yet the Panamera doesn't quite handle like a pert coupe, and purists may find this model to lack the nimble, athletic feel they expect from a Porsche in tight corners. There's quite the wide range of models in the 2016 Panamera line: the standard Panamera, Panamera S, Panamera GTS, Panamera Turbo, and Panamera S E-Hybrid form the core of the range. Panamera and Panamera S models can be had with all-wheel drive in 4 and 4S models. 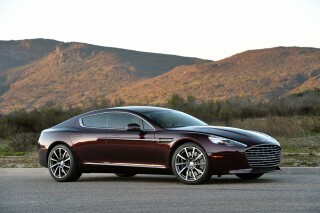 The high-performance GTS and Turbo models come standard with all-wheel drive; the S E-Hybrid is rear-drive only. Panamera 4S and Turbo models can also be had in long-wheelbase Executive form. Base models now make 310 hp from their 3.6-liter V-6, getting them to 60 mph in 5.7 seconds with the Sport Chrono performance package, while S and 4S models get a turbo 3.0-liter V-6 making 420 hp and Panamera Turbo models make 520 hp from their twin-turbo V-8, capable of the dash to 60 in as little as 3.7 seconds. 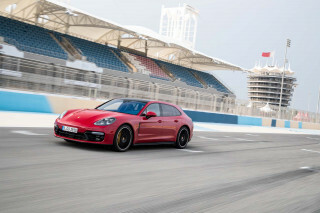 The GTS is the driver's pick of the Panamera line, its strong and sonorous 440-hp 4.8-liter V-8 engine cranking out 384 pound-feet of torque. All-wheel drive and the best steering of the Panamera range further enhance performance. PDK 7-speed dual-clutch transmissions are standard on all models except the S E-Hybrid, which uses an 8-speed Tiptronic S transmission. And whichever model you choose, the Panamera's chassis remains an able basis, delivering better handling than you'd expect from its 4,000-pound-plus curb weight. The strong basis is aided by Porsche Active Suspension Management (PASM), Porsche Dynamic Chassis Control (PDCC), and, if equipped, the Sport Chrono package, which add electronic enhancement that improves handling as well as safety. In the Panamera S E-Hybrid, a supercharged 3.0-liter V-6 engine joins an electric motor with plug-in charging capabilities. Rated at 416 combined hp, which includes the output of the 95 horsepower electric motor, the S E-Hybrid doesn't feel as sprightly as the non-hybrid S models, due to the extra weight—about 550 pounds—of the hybrid system and its 9.4-kWh lithium-ion battery pack. The hatchback-like profile adds clearance for larger packages or luggage, and the seats lay out almost flat. Porsche even claims two fully-assembled bicycles will fit in the rear. Fit, finish, and materials are all held to a high standard, and ride quality is quite good—although it isn't quite to the standards of cabin quiet as some luxury-sedan rivals. As for features and electronics, Porsche offers many standard and optional systems, including standard ParkAssist distance-sensing, standard cruise control, a standard Porsche Communication Management system with 7.0-inch touchscreen and navigation with 3-D maps. An Sport Chrono package (standard on Panamera GTS) is available, with improved performance modes; and a range of highly adjustable power seat upgrades are also available. The big news for 2016 is a new rear seat entertainment system option. Previously the exclusive domain of the Panamera Turbo S Exclusive Series, this system is now available on all models, and it includes a 10.1-inch touchscreen, DVD player, two USB ports, an SD card slot, and HDMI port—plus a camera for video calls, a remote control, and two wireless headsets. There's also an internet browser, mobile data access, and wi-fi hotspot capability. Also, as a last hurrah for this generation of the Panamera (a new one's due next year), Porsche will roll out the new Panamera Edition and Panamera 4 Edition models. A special high-gloss black trim look, 19-inch wheels borrowed from the Panamera Turbo, and two-tone leather interior, Bose 14-speaker audio, and various other extras make this one for those who want the head-turning look but not all the customization or countless extras. The base Panamera V-6 is actually quite fuel-efficient. It scores 18 mpg city, 28 highway, 22 combined per the EPA; adding all-wheel drive with the Panamera 4 brings the rating to 18/27/21 mpg. The thirstiest model, a Turbo S, yields 15/24/18 mpg ratings. The rare hybrid earns a 50 mpg combined rating in hybrid mode, only 25 mpg combined in gas-only. Not everyone's going to like the profile and rear roofline of the 2016 Porsche Panamera, but it looks like a Porsche inside and out. The Porsche Panamera—perhaps more than any other model on the market—looks like a mashup of sports car and sedan. For some, that's going to be exactly the sort of design sweet spot they seek; while for others it's sacrilege—OK, well maybe not as much as having a Porsche SUV, but almost as heartburn-inducing. To the former group—the realists, we'll call them—Porsche's found reasonable success with the Panamera. This model essentially grafts Porsche's familiar sports car front end, from its legendary 911, onto a very voluptuous sedan. It's changed very little over the past several years, yet it remains just as attention-getting. The design has an unusual configuration of curves. For those who appreciate it, it’s handsome at best, with many attractive details. Others may see the rear view downright ungainly, particularly from side angles. Part of the issue is that the long roofline (even longer on Executive models) drops toward the tail with a bubbled curve, creating fantastic room for rear seat passengers but losing some grace in the process. The rear view is simple and largely unadorned, but suffers from the unusual rear roof and window area. From the front, the Panamera has kept pace with Porsche's sports cars; it gained wider air intakes and some crisper detailing a couple of years ago, as well as a more sharply radiused power-dome hood. Still, on the whole, the Panamera is comely—it’s just not for everyone. Inside the Panamera, the story is different—and less controversial. The cabin has a stylish, high-tech look, with some straight lines and flat surfaces making this an interesting counterpoint to the warmer, more organic look being set within a lot of other luxury models. Porsche opts for a slew of buttons instead of burying functionality within touchscreen menus, and we think most driver's-seat-focused Porsche shoppers are going to like that. There's much of the vivid performance of the 911 lineup here in the Panamera—albeit with a lot more comfort, luxury, and practicality. The Panamera looks quite a bit like the 911 from the front, and an unusual touring hatchback from the rear; and you can draw quite a few parallels between that design theme and how this model drives. There's quite the wide range of models in the 2016 Panamera line: the standard Panamera, Panamera S, Panamera GTS, Panamera Turbo, and Panamera S E-Hybrid form the core of the range. Panamera and Panamera S models can be had with all-wheel drive in 4 and 4S models. 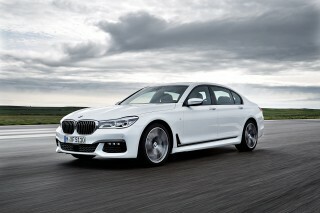 The high-performance GTS and Turbo models come standard with all-wheel drive; the S E-Hybrid is rear-drive only. Panamera 4S and Turbo models can also be had in long-wheelbase Executive form. At the entry point, the Panamera keeps its familiar 3.6-liter V-6 engine. With 310 horsepower and 295 pound-feet of torque on tap, it's the slowest Panamera, clocking six-second 0-60 mph times with rear drive (5.7 seconds with Sport Chrono) or 5.8 seconds with all-wheel drive in the Panamera 4 (5.5 seconds with Sport Chrono). The V-8 engine previously used in S and 4S models was replaced last year with a twin-turbocharged 3.0-liter V-6 offering more power and greater efficiency. Rated at 420 hp and 384 lb-ft of torque, the new V-6 is up to the task, whether cruising to the mall or bombing down the Autobahn. The Panamera S cuts acceleration times to 4.9 seconds (4.6 with Sport Chrono) and the 4S manages 4.6 seconds (4.3 with Sport Chrono). Adding the 5.9-inch wheelbase (and attendant weight) of the Executive to the 4S adds 0.2 seconds back to the 0-60 mph time. The GTS is the driver's pick of the Panamera line, its strong and sonorous 440-hp 4.8-liter V-8 engine cranking out 384 lb-ft of torque. All-wheel drive and the best steering of the Panamera range further enhance performance. The steering improvement in the GTS is most noticeable when switching between models, with the GTS's solid, connected feel a strong contrast to the somewhat overboosted, floaty feel of much of the rest of the range. The Panamera GTS is the second-quickest of the Panamera range, hitting 60 mph in just 4.2 seconds, 0.3 seconds behind the Panamera Turbo, which Porsche lists at 3.9 seconds (or 3.7 seconds with Sport Chrono). The most high-tech drivetrain is found in the Panamera S E-Hybrid. A supercharged 3.0-liter V-6 engine joins an electric motor with plug-in charging capabilities. Rated at 416 combined hp, which includes the output of the 95 hp electric motor, the S E-Hybrid doesn't feel as sprightly as the non-hybrid S models, due to the extra weight—about 550 pounds—of the hybrid system and its 9.4-kwh lithium-ion battery pack. That said, the S E-Hybrid is quick for a hybrid, and despite the extra heft, Porsche's suspension tuning excellence helps the big car handle well. The S E-Hybrid can also run for up to 22 miles (claimed) in all-electric mode, and do so at speeds up to 83 mph—or coast ("sail," as they call it) with the gasoline engine switched off if you gently lift off the gas, in some situations, at speeds of up to 103 mph. 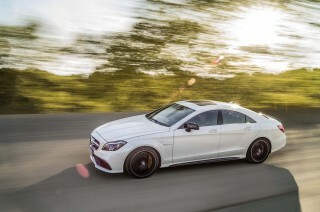 It's also right in the middle of the range, in terms of acceleration, as it can hit 60 mph in 5.2 seconds. The Panamera Turbo gets a 520-hp twin-turbo take on the 4.8-liter V-8, making it undeniably quicker than the GTS in a straight line, but it's a more relaxed, less pure driving experience. PDK 7-speed dual-clutch transmissions are standard on all models except the S E-Hybrid, which uses an 8-speed Tiptronic S transmission. Regardless of model, the Panamera's chassis remains an able basis, delivering better handling than you'd expect from its 4,000-pound-plus curb weight. The strong basis is aided by Porsche Active Suspension Management, Porsche Dynamic Chassis Control, and, if equipped, the Sport Chrono package, which add electronic enhancement that improves handling as well as safety. Porsche's high-tech luxury makes the translation to sedan form very well, and the Executive model's roomy rear seat adds to the comfort and spaciousness. Forget all the sports car associations, the 0-60 mph times, and the bragging rights of the brand for the moment; the 2016 Porsche Panamera really is a very practical, spacious, and comfortable four-passenger hatchback—with unusually generous, limousine-like seating space in back. The Panamera offers very comfortable, supportive front seats, with a driver-focused dash that allows the passenger easy access to the touchscreen and other controls. Throughout the cabin, head room, leg room, and hip and shoulder room easily meet the demands of 6-footers and 200-plus-pounders. 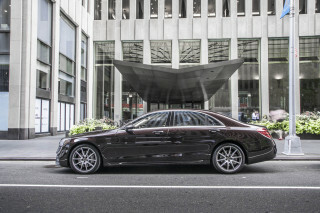 And if you'd like to maximize what's in back, the long-wheelbase Executive model (available on 4S and Turbo variants) adds 5 inches of legroom, plus a redesigned seatback; it might not have all the rear-seat amenities of luxury flagships like the Mercedes-Benz S-Class or BMW 7-Series, but many will find the seating space to be even better. Even in standard wheelbase models, the rear seats are plenty spacious and quite comfortable. And across the lineup, getting in and out of the back-seat positions is easy. Rear seats also fold down for more cargo space; and the hatchback layout helps make the most of it for loading larger items. Pretty much all the touch points within the Panamera are leather-clad or soft-touch, and very luxurious in look and feel. You'll find some hard plastic around the side pillars and below the knee line. If you poke and prod around the less-accessible parts of the cabin (around the B-pillars, and below the knee-line) you'll find quite a bit of hard plastic, but all of the touch points are leather-clad or soft-touch and luxurious. The Panamera isn't quite as super quiet inside as some rival models, but ride quality is superb, with Porsche's advanced suspension and chassis control systems helping to maximize ride comfort while keeping a sporty feel. Although missing official crash-test ratings, the 2016 Porsche Panamera has an impressive feature set. The 2016 Porsche Panamera has not been tested or fully rated by either the NHTSA nor the IIHS, the two major agencies that conduct crash-testing in the U.S.
That's a relatively common situation for luxury models like the Panamera. Yet you'll find a long list of safety equipment here, with dual front, side, knee, and side-curtain airbags standard, plus an active pop-up hood for pedestrian protection. Rear-seat side airbags are optional. Porsche's well-tuned electronic stability and dynamics controls, plus all-wheel-drive (available; and standard on some models) help enhance traction and improve all-weather drivability, safety, and emergency maneuvering. What's missing in the Panamera are the high-level active-safety systems—with automatic emergency braking, lane-keeping, and cross-traffic alerts—that are rapidly becoming a differentiating factor in some of the flagship luxury models. But there is an available surround-view camera system for parking and low-speed maneuvering in tight situations, plus available lane departure warning and adaptive cruise control with Porsche Active Safe, which will brake all the way down to a stop, and restart when traffic clears. The 2016 Panamera still doesn't measure up in tech and comfort features to flagship luxury sedans, but it makes up for it with performance and customization options. The 2016 Porsche Panamera may overlap large luxury sedans like the Mercedes-Benz S-Class and BMW 7-Series in some ways, but it's considered by a different kind of buyer entirely—one who's typically not as wedded to leading-edge comfort and tech items like active massage seats, head-up displays, or night vision systems. Instead, Panamera buyers often want exclusivity and a taste of the bespoke look and feel of prestige sports cars. For that, there's a wide range of available exterior and interior colors and combinations, including wood, aluminum, and carbon fiber trim. The Panamera is a highly configurable car, although the caveat is to be wary of the bottom line as you tick boxes—the price can become stratospheric. 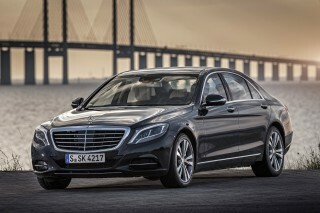 All models get standard bi-xenon headlights, and optional LED headlights were added last year. The Porsche Dynamic Light System Plus comes with the LED headlights (now standard on Turbo models), adapting the beam to oncoming traffic, reducing glare for other drivers. Four-point daytime running lights are also included with the LED package. Last year, Porsche made standard a system with satellite radio with HD radio and Porsche online services, while Turbo models gained Porsche Dynamic Lighting System and GTS models available without the GTS emblems on the doors. Executive long-wheelbase variants for the 4S and Turbo continue for 2015, extending the wheelbase by 5.9 inches and leg room by 4.7 inches, which allows for increased recline angle of the electronically adjustable rear seat. Heated and ventilated seats are standard in all models, controllable from both front and rear, and four-zone automatic climate control adapts each position for individual comfort. An available Burmester sound system offers crisp, clear audio—a noticeable upgrade over the standard system. A Sport Chrono package boosts performance-focused features and adds a dash-mounted multi-function timer/clock. Porsche's Car Connect app, standard on Panamera S E-Hybrid models (and available on all other models), offers three types of remote access: vehicle tracking; remote services, which offers information on the car's status; and hybrid-specific services for the S E-Hybrid; plus a variety of other remote vehicle functions. The greenest option is the S E-Hybrid, although most of the lineup isn't too thirsty in context. The 2016 Porsche Panamera definitely offers a wide range of choice, with powertrains to suit a wide range of expectations for performance—and fuel-efficiency. The best mileage in the range comes from the high-tech Panamera S E-Hybrid. It's rated two ways; with electric-only and gasoline-hybrid mode combined, it scores 51 mpg combined city/highway; in gasoline-only mode, it scores a combined 25 mpg. For a large, high-performance vehicle, both of those ratings are impressive—at least in context. The base Panamera V-6 is actually quite fuel-efficient. It scores 18 mpg city, 28 highway, 22 combined per the EPA; adding all-wheel drive with the Panamera 4 brings the rating to 18/27/21 mpg. Step up to the higher-performance Panamera S and you get 17/27/21 mpg ratings, while the Panamera 4S downsizes the V-6 and adds a turbo to yield EPA ratings of 17/27/21 mpg. Long-wheelbase Panamera 4S Executive models score 17/26/20 mpg. The driver's car of the lineup—and probably our pick, if you're going to get a Panamera—is the GTS, which scores 16/24/19 mpg with its 4.8-liter V-8 engine. The extremely fast Panamera Turbo does better than most would expect, with EPA ratings at 15/24/18 mpg combined. The nearly bonkers Panamera Turbo S yields the same 15/24/18 mpg gas mileage, whether in standard wheelbase or long-wheelbase Panamera Turbo S Executive form. All models in the lineup now include engine stop-start that can be deactivated in all models except the Hybrid. The S E-Hybrid can recharge from a 240-volt outlet with the included charger cable in about 2.5 hours, or it's capable of giving the batteries a full charge while driving, drawing extra power (and generating extra emissions) from the gasoline engine in that mode. Last of the big block, normally aspirated V8s. Looking for a different year of the Porsche Panamera?